Milk makes lots of people fart. Drinking raw milk is like playing Russian roulette with serious stomach issues, and moo juice may not exactly be the calcium-packed powerhouse the dairy industry would like you to believe. But the one thing milk is surprisingly good at, other than being the preferred liquid to dunk cookies in, is rehydrating your body. At least, that's according to a new study that also claims cola and orange juice are more hydrating than water. Clearly, researchers overrode their common sense, and instead just measured how good certain beverages are at rehydrating your body based on how much people had to pee after drinking them. If you pee less frequently but are consuming the same water content, the assumption goes, you're drinking a hydrating beverage. The result is a shiny new hydration index, which ranks 13 different liquids -- including sparkling water, cola, orange juice, lager, hot black coffee, full-fat milk, and skim milk -- and at the very least serves as a guide to liquids that won't make you pee every 20 minutes. What the hell is this hydration index? Researchers wanted to find out how much water your body absorbs from various drinks, based on several factors: how many carbs and electrolytes are in each drink, the sodium content, and if there’s a diuretic present. The hydration index attempts to recreate with liquids what the glycemic index does for food, but somewhere along the way the ranking ends up claiming beer is basically on par with sports drinks at replenishing lost fluids. Which is totally fine! Researchers also looked at how much each person peed after drinking each beverage, and compared it to the still water control group. Full-fat milk, for example, created less urine than water did in participants, but coffee produced more -- not shocking to anyone who's had to sit in traffic after chugging a venti iced coffee. By the study’s standards, less urine equated to more hydration. To put it into chart form, researchers divided the amount of urine passed after drinking the still water, by the pee passed after each test beverage, creating a "beverage hydration index," or BHI. A high BHI means more water is retained in the body than if the drinker had consumed an equal volume of still water. They also left a margin of error to include the water content of each beverage (water obviously has more water content than coffee does, for example), but that didn’t seem to make much of a difference. The upshot? According to this ranking, skim milk is the most hydrating beverage on the block. Should I be chugging milk after every workout? Though this ranking points to skim milk as the most hydrating drink, don’t start stocking up on the fat-free stuff just yet. First of all, milk after a workout is gross. Also, whole milk provides more vitamins and nutrients, and nearly 65% of people can't digest dairy. Finally, since the index claims cola is more hydrating than water, this probably serves as a good reminder that even a study with straightforward methods and no hidden agenda can be deeply flawed. For your post-workout refuel, it’s best to use common sense and stick to the tried-and-true method of plain water. If you’re a serious athlete or training for a marathon, meaning you're exercising intensely for two or more hours straight, then it’s fine to reach for your favorite sports drink. 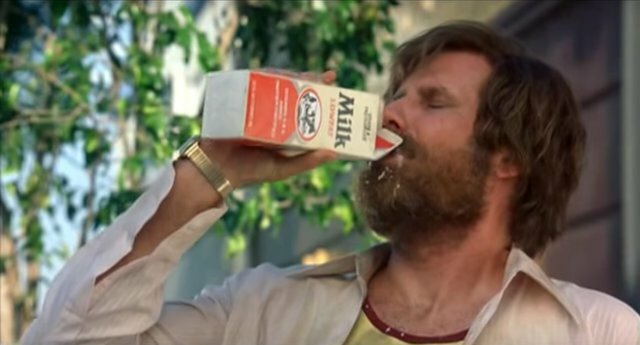 But if you're feeling a little extra thirsty, or looking for something that won't make you run to the restroom ASAP, maybe Ron Burgundy was wrong after all; milk’s really not a bad choice.